Sweaty palms? Rapid heart rate? Churning tummy? Sitting down to write your very first query letter for your book can be nerve-racking—even stymying! 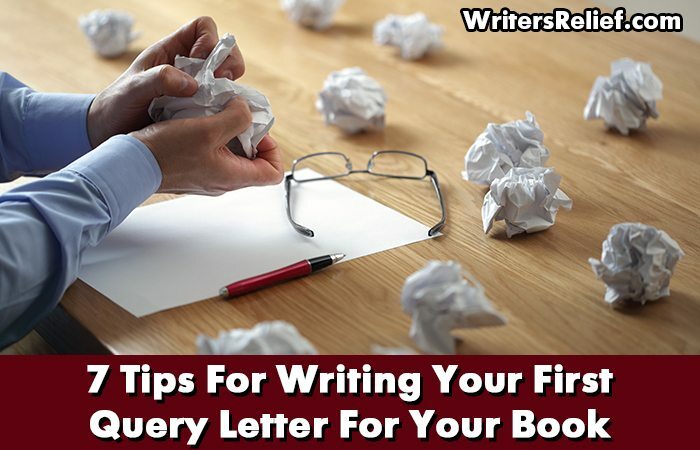 Here at Writer’s Relief, we’ve been helping new writers get published since 1994—and we’re glad to pass along these tips to help you write your first ever query letter for finding a literary agent for your novel or other book! Lay a great foundation. The work of writing a great query begins long, long before you actually start to type it. For example: Building up a foundational author bio before you pitch can help indicate your dedication to craft—but that work has to happen before your queries go out. Here are some strategies that will put you in a great place when you finally do sit down to start writing your letter. Master your genre. The trick to correctly identifying the genre of your book in your query letter is knowing the ins and outs of book genres even before you start writing. (For example, if you’re thinking your book idea might be young adult, it’s time to start avidly reading young adult—if you’re not already.) Learn the tropes of your potential genre as well as publishers’ expectations (like genre word count). If you’re still not sure what genre to call your book by the time you sit down to write your query, you can use these tips to figure out which genre is best for your pitch. Get right to the point. Some new writers try too hard with their query letter’s first line. Here are some strategies for writing a great opening line for your query. Include key phrases. It’s easy to overlook these essential query letter phrases! Leave these phrases out. New writers and even veterans sometimes add these questionable phrases to query letters—at their own peril! Focus on specific plot and facts. Agents tend to prefer book summaries that get to the heart of a book’s story and plot—as opposed to statements about a book’s thematic explorations and aspirations. Strike the right tone. First-time query writers can be a teensy bit too emotional in their query letters. (This book is the best book ever written! Or even, I’m sorry I don’t have more publishing credits to share with you because I’m new.) A good query letter stirs literary agents’ emotions through facts—not pleading or bragging. Learn more about how to strike the right tone in your query letter. Sometimes, writers worry that their first query letter wasn’t as good as it could have been. If only I’d written my synopsis differently! If only I’d said it was a different genre! When that happens, you might want to revise your query letter and send it out again. Question: What’s the hardest part of writing a first query letter?